Since its inception in 1988 Interlink Alloy Systems has grown into one of the largest independant access related manufacturing companies in the UK, with a turnover of £2.7million. Originally set up as a repair facility, we now have our own range of access products, as well as compatible equipment for most makes of towers. 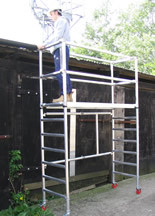 Our own products include the 'Stair Span' range of towers, the 'Fold-easy' folding base system, the 'Stairdeck' stairwell system, and the jewel in the crown, the 'Podium' range of steps. Interlink are the inventors and manufacturers of the original Podium steps which provide the first real safe alternative to builders steps. The latter have become virtually redundant with the advent of the Working At height Regulations (WAHR) and pressure from increased employer liability insurance costs. An expanding part of our business is in the specialist access field where standard equipment will not always provide a solution. We have a CAD 'library' of over 50000 custom designed structures that we have manufactured to specialist requirements such as access over workstations or on escalators.